The 920 Series of energy-efficient coalescent oil separators are designed to make refrigeration systems clean and green by lowering energy costs and reducing carbon emissions. Higher efficiency means better heat transfer through the coils, translating into significant kW savings. The 920 Series is not dependent on velocity for efficiency. Coalescent oil separators maintain the same level of effectiveness down to 20% of maximum flow. See the Energy Study below for independent test results. 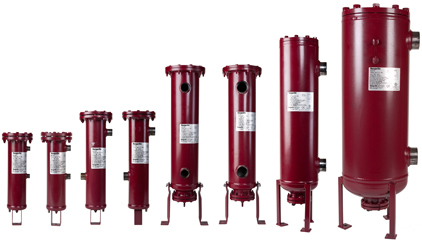 All 920 Series separators are ammonia (NH3) compatible and designed for 650 PSI. Ammonia is a cleaning agent, meaning more dirt is removed from the system and deposited in the filter. 920 Series separators offer easy accessibility to the filter for changes. Other products require disassembling and re-welding the separator just to change the filter. Dirt, contaminants and excess refrigerant oil are the biggest energy drains on any refrigeration system. New refrigerants coming onto the market have an enhanced solvent effect, meaning more contaminants than ever can clog your system. Energy savings scale up with larger systems. In large parallel rack/multiplex systems with long lines, dirt and excess oil put an even greater drag on the system. All 920 Series models are design for use with an external reservoir.